Dams are structural barriers built to obstruct or control the flow of water in rivers and streams. They are designed to serve two broad functions. The first is the storage of water to compensate for fluctuations in river discharge (flow) or in demand for water and energy. The second is the increase of hydraulic head , or the difference in height between water levels in the lake created upstream of the dam and the downstream river. They can be operated in a manner that simultaneously augments downstream water quality, enhances fish and wildlife habitat, and provides for a variety of recreational activities, such as fishing, boating, and swimming. Four major classes of dams are based on the type of construction and materials used: embankment, gravity, arch, and buttress. Embankment dams typically are constructed of compacted earth, rock, or both, making them less expensive than others that are constructed of concrete. Consequently, more than 80 percent of all large dams are of this type. Embankment dams have a triangular-shaped profile and typically are used to retain water across broad rivers. Gravity dams consist of thick, vertical walls of concrete built across relatively narrow river valleys with firm bedrock. Their weight alone is great enough to resist overturning or sliding tendencies due to horizontal loads imposed by the upstream water. 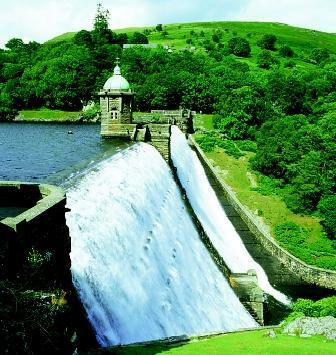 The 37-meter-high Pen–y–Garreg Reservoir Dam and three associated dams were constructed on the government-owned Elan Valley Estate in mid-Wales (United Kingdom) at the turn of the twentieth century to provide a safe water supply for the city of Birmingham. By the close of the twentieth century, new hydroelectric turbines had been installed below ground at the base of the historic dams to provide small-scale power generation while safeguarding the habitats of the estate's diverse plant and bird species. to narrow canyons with strong rock walls that can resist the arch thrust at the foundation and sides of the dam. Buttress dams are essentially hollow gravity dams constructed of steel-reinforced concrete or timber. Careful planning throughout the siting, design, and construction of dams is necessary for optimal utilization of rivers and for preventing catastrophic dam failure . These planning phases require input from engineers, geologists, hydrologists, ecologists, financiers, and a number of other professionals. Designers must first evaluate alternative solutions and designs for meeting the same desired objective, whether the goal is to allocate water supply, improve flood control, or generate electricity. Each alternative requires a comprehensive cost-benefit analysis and feasibility study for evaluating its physical, economic, ecological, and social impact. Analysis of dam safety and failure concerns. When a dam is put into operation, or commissioned, water is released from the upstream reservoir over a spillway or through gates in a manner to satisfy intended objectives. Operating rules for maximizing power generation, for example, include maintaining hydraulic head. In contrast, water levels in flood control reservoirs must be periodically reduced to allow for new storage during anticipated periods of flood hazard. Operating issues, however, can easily become complex and highly politicized and may be difficult to resolve. This is particularly true for river systems containing several reservoirs, for dams serving multiple purposes, and in cases where adverse social, ecological, and environmental impacts are significant. The first dam for which reliable records exist was built on the Nile River sometime before 4000 B.C.E. near the ancient city of Memphis. Remains of other historic dams have been located at numerous sites bordering the Mediterranean Sea and throughout the Middle East, China, and Central America. The oldest continuously operating dam still in use is the Kofini Dam, which was constructed in 1260 B.C.E. on the Lakissa River in Greece. Today, there are approximately 850,000 dams located around the world. Of the more than 40,000 that are categorized as large dams, more than half are located in China and India. It is estimated that 24 countries currently generate more than 90 percent of their electrical power from dams, and 70 countries rely on dams for flood control. Dams in the United States. Large-scale construction of dams occurred in the United States during the post–World War II years and reached its peak in the 1960s. The organizations that have been primarily responsible for dam-building are the U.S. Army Corps of Engineers, the Bureau of Reclamation (part of the U.S. Department of the Interior), and a number of public and private utility developers. Arizona's Glen Canyon Dam on the Colorado River shows the curvature in arch dams that provides structural stability. The rock walls of the deep canyon absorb a majority of forces that result from the upstream reservoir, Lake Powell. constructed by the Corps include Garrison, Oahe, Fort Peck, and Fort Randall Dams. The second group, the Bureau of Reclamation, was established in 1902, when Congress passed the National Reclamation Act. The Bureau was initially charged with developing irrigation and power projects in seventeen western states and has been responsible for the construction of more than six hundred dams and reservoirs, including the massive Hoover, Shasta, Glen Canyon, and Grand Coulee Dams. The third organization responsible for dam construction encompasses various power administrations, such as the Tennessee Valley Authority, the largest public power company in the United States, as well as others operating under the Federal Power Act of 1920, which provided for the licensing of privately built dams to produce electric power. In part because of this mid-twentieth-century dam-building era, the U.S. dam population has approached 75,000. 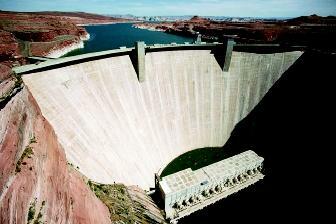 More recently, however, the rate of dam construction in the United States is exceeded by the rate of decommissioning . In many cases, maintenance costs for aging infrastructure, significant social and ecological impacts, high construction costs, and the reduced availability of suitable sites have made alternatives to dams more viable. SEE ALSO Army Corps of Engineers, U.S. ; Bureau of Reclamation, U.S. ; Cost-Benefit Analysis ; Hoover Dam ; Hydroelectric Power ; Recreation ; Reservoirs, Multipurpose ; Supply Development ; Tennessee Valley Authority . Linsley, Ray K. et al. Water Resources Engineering, 4th ed. New York: McGraw-Hill, 1992. Mays, Larry W. Water Resources Engineering. New York: John Wiley & Sons, 2001. Morris, Gregory L., and Jiahua Fan. Reservoir Sedimentation Handbook. New York:McGraw-Hill, 1998. U.S. Department of Interior, Bureau of Reclamation. Design of Small Dams, 3rd ed. Denver, CO: U.S. Government Printing Office, 1987. World Commission on Dams. Final Report: Dams and Development—A New Framework for Decision-Making. Cape Town, South Africa: World Commission on Dams, 2000. The World Commission on Dams. <http://www.dams.org> . The world's two tallest dams are located in Tajikistan in the city of Vakhsh where they tower over 335 meters, or 1,100 feet tall (Rogun) and 300 meters, or 985 feet tall (Nurek). The Three Gorges Dam in China, a concrete gravity dam scheduled for completion in 2009, will be 175 meters tall (574 feet), the equivalent of a 48-story building. When completed, Three Gorges Dam will be the world's largest hydropower facility with a generation capacity of 18,200 megawatts. It will simultaneously supply flood storage and enhance navigation along the Yangtze River. The structure will create a reservoir more than 600 kilometers long and 1,100 meters wide, capable of storing 39.3 billion cubic meters of water. Construction of the dam, which began in 1993, requires the inundation of 632 square kilometers of existing land and will cause the permanent relocation of over 1.2 million people. can we built aseries of dams on one river with specified distance between them?